Andreu Lacondeguy is clearly stoked on breaking his three-year fourth place curse. Photo by Anthony Smith. The brand-new Rampage course in Virgin, Utah, proved favorable for Spain’s Andreu Lacondeguy, who came away with his first win at the big-mountain competition on Monday. Lacondeguy scored a 95.25 on his first run, beating out last year’s winner Kyle Strait, who finished fourth, and two previous winners, Cam Zink, who finished second, and Brandon Semenuk, who finished third. Semenuk’s finish was enough to seal the FMB Diamond Series title. Zink’s 360 of the massive stepdown won him Best Trick. 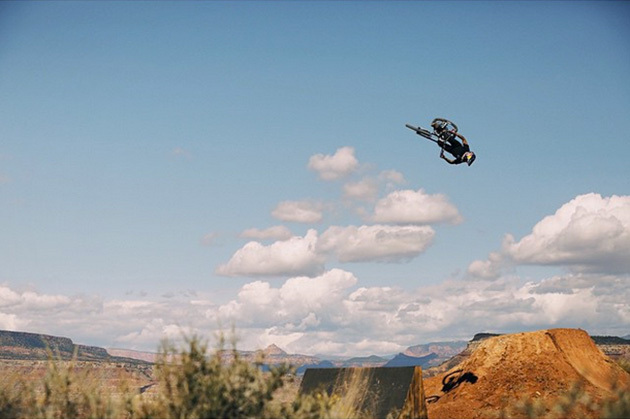 After an exciting weekend of weather delays and insane line building, riders went bigger than ever Monday with several people back-flipping the 73-foot canyon gap, as well as a miscalculated frontflip attempt by Tom van Steenbergen, who crashed on the landing. Lacondeguy has been coming to Rampage for years and placed fourth for the past three years in a row. 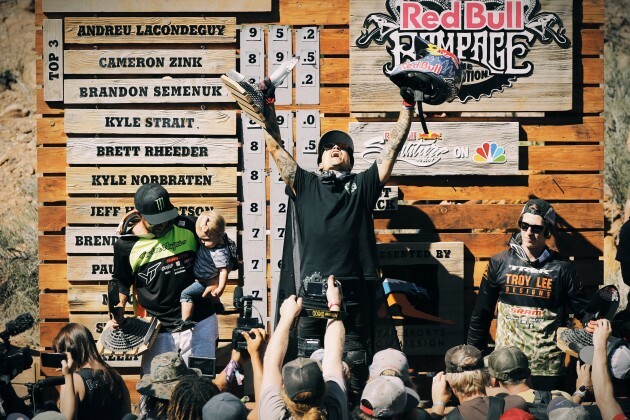 He was vocal about his desire to return to Rampage this year to not only break that streak, but to take the top spot, which he did with his impressive first-run score. Even though Lacondeguy opted out on doing his full second run, he still gave his fans a show at the bottom of his line. Photo by Anthony Smith. Stay tuned for a photo gallery and final write-up from our team on the ground.